Staying in a private safari lodge is a sensational experience and the very best way to get a close-up encounter with African wildlife. Generally located within a concession in a National Park or in a neighbouring reserve or conservancy, private safari lodges offer unbeatable safaris in stunning settings. The lodges are usually situated on privately owned or leased land, which means that they are not subject to the same rules as National Parks. 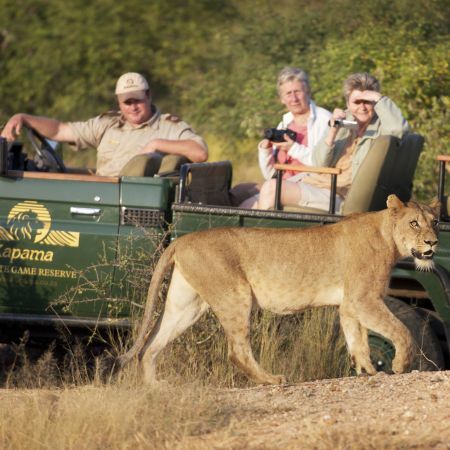 As a result, if you stay in a private safari lodge your game drive will not be restricted to the road network, meaning that you can race off deep into the heart of the African bush on the lookout for the Big Five. You’ll be treated to nerve-tingling game drives as your experienced guide and tracker follow the wildlife over the hills, valleys and forests of the reserve at dawn and dusk. Off-roading, you’ll also be able to get closer to the animals than you would ever imagine - sometimes literally within a couple of metres. Private lodge guides are all highly trained and exceedingly knowledgeable about the bush, so they’ll have the answers to all of your safari questions at their fingertips. During your game drives, you’ll learn some eye-opening safari facts and your guide will share some intrepid tales about life in the bush. Please note that a few of the private lodges, particularly in East Africa, are situated within National Park boundaries, which rules out off-road safaris. Private safari lodges come in an amazing assortment of shapes, sizes and levels of luxury. Each one has a character all of its own, but every one of them is surrounded by the sights and sounds of the African bush. Whichever lodge you choose, you’re in for a atmospheric and authentic African safari. In general, private lodges are exclusive pockets of welcoming African hospitality in the bush, mostly with just 4 to 20 rooms. This makes for a very personal and intimate experience, and you’ll find an outstanding level of service during your stay. There’s a private lodge out there to suit every taste and many of them are examples of stunning design. Some feature traditional African decor and tribal accents while others are steeped in sleek contemporary style, forming an incredible contrast to the surrounding bush. This means that whether you’re looking for a classic lodge or something altogether more cutting-edge, you’ll find that there’s a lodge for you. If you fancy spending a few nights under a canvas surrounded by clear starry skies and the sounds of the bush, Africa has dozens of romantic tented camps that will bring you all the magic of a bygone age of vintage safari. Many of the tents are lavishly kitted out with en-suite bathrooms, 4 poster beds and mosquito nets, so while you’ll be in for a remote outdoor adventure, you certainly won’t be roughing it. The video below gives a good idea of the similarity and differences between 2 of our favourite lodges in the Kruger National Park - the 5* Lion Sands River Lodge and 4* Africa on Foot. Private lodge facilities are second to none, so you won't be short on creature comforts during your safari. Most lodges have swimming pools, giving you a chance to stretch out in the sunshine between game drives and many lodges include small gyms and spa treatment centres. All lodges have outdoor areas offering stunning panoramic views and many have a traditional 'boma area' where you can enjoy a blazing bonfire under a canopy of stars. All private lodges offer a fully inclusive African safari, and the rates usually include your accommodation, all meals and both sunrise and sunset game drives in customised game viewing vehicles. Some lodges also offer guided game walks, giving you thrilling on-foot adventures in the bush. The more expensive lodges will also include all of your drinks, sometimes a laundry service and even complimentary spa treatments. It’s also fair to say that the more prestigious and expensive lodges all provide superior accommodation, with sumptuously spacious suites where you can lose yourself in safari splendour, complete with private viewing decks and personal plunge pools. 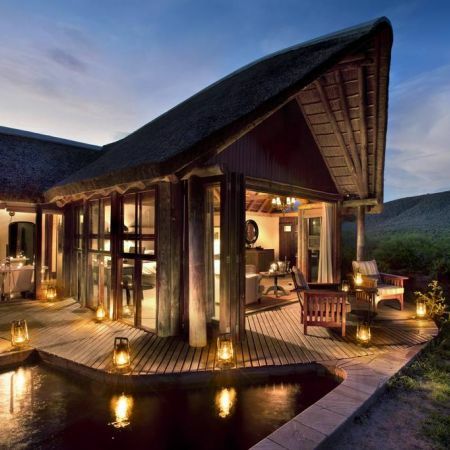 If you’re looking to take a safari in truly indulgent style, these lodges will tick every box. 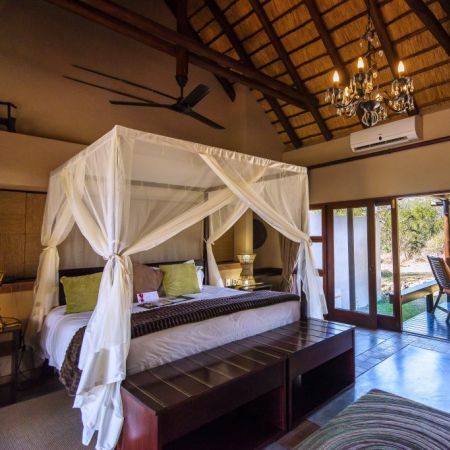 Some of these deluxe lodges also offer a more exclusive game viewing experience, particularly if they are the only lodge on a concession or private reserve because they’ll have exclusive rights to drive on the land. In East Africa, several of the lodges offer Full Board rates designed to cater for travellers using a private driver-guide to explore the country. Taking this type of safari is a brilliant way to stretch your budget and keep costs at an affordable level, so it’s definitely worth bearing in mind. While each private lodge is run independently, the rhythm and structure of the safari tends to be the same, so here’s a sneak peek at a typical stay at a private lodge. Most guests tend to arrive around lunchtime, giving you ample time to settle into your room, enjoy a leisurely lunch and meet your fellow guests. A few hours later, you’ll jump into your open-topped jeep for your first afternoon/evening game drive and your safari will commence! In general, the afternoon game drives leave at around 3:30pm or 4pm depending on the time of the sunset during your stay. 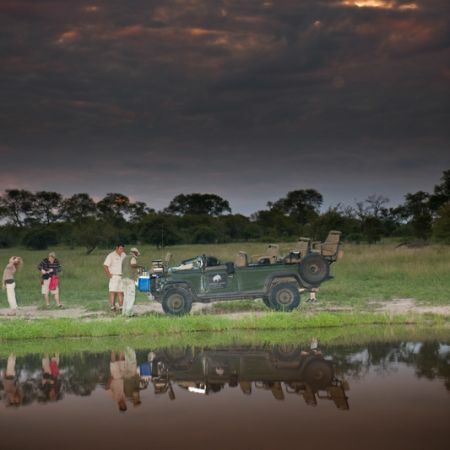 After tracking the wildlife through the bush for a couple of hours, you’ll make a dusk stop in a scenic spot. Here, your guide will unpack the cooler box and offer to mix you a safari sundowner. There is something totally bewitching about gazing into the bush as you sip on a cold beer or chilled glass of wine, while the blazing sun sinks into the horizon beyond! It’s all part of the magic of an African safari. After your sundowner stop, your safari will continue with the aid of a spotlight to help you spot the elusive nocturnal life of the bush. If you’re really lucky, you might even stumble across a leopard starting his hunt as you head back to the lodge. When you get back to the lodge, your dinner will await you and you’ll soon see that private safari lodges offer top-class cuisine. Sometimes, dinner is served outside under the stars in a traditional ‘boma’ area around an open fire with candles or lanterns as the only form of lighting. Between the star-studded skies, flickering flames and distant sounds of the bush, this is an incredibly atmospheric experience. Chatting about your safari adventures with your fellow guests is a perfect way to end the day and you’ll soon find that friendships strike up as you sit around the fire. Some lodges will seat guests at the same tables every day, giving you a chance to really get to know your safari companions, while other lodges will offer private tables for your party only, meaning that you choose to be as social or secluded as you like. Of course, there’s nothing to stop you asking the lodge to make a larger table with other guests if you have made new friends! The early bird definitely gets the best game drive, so you’ll receive a wake up call around 5:30 am. 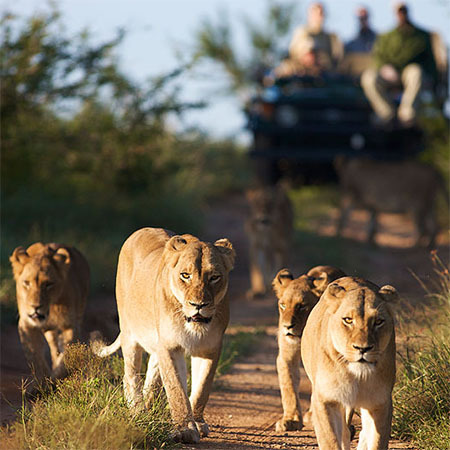 After a steaming cup of strong coffee to clear out the cobwebs, you’ll set off on your morning game drive at around 6am. If the coffee hasn’t quite jolted your eyes wide open, the crisp morning air and the possibility of bumping into a pride of lion certainly will! The morning game drive will usually last 3 or 4 hours and you’ll make a panoramic pitstop on the way to refuel on coffee and stretch your sleepy legs. When you return to the lodge, a hearty breakfast will be waiting for you, usually a buffet-style affair with cereal and fruit, as well as a cooked option if you’re still hungry. The next few hours are entirely your own. You can stretch out in the African sunshine next to the swimming pool, treat yourself to some pampering at the spa, head for the viewing deck with a good book or grab forty winks after the early morning action - it’s completely up to you. Most private lodges can arrange guided bush walks with an experienced guide or tracker, and this is a brilliant way to get a new perspective on the bush. Walking in single file, the guide will teach you how to track animals, identify birds, pick out tree species and spot insects. If you’re lucky, you might even come across impala, giraffe or even rhino - something truly thrilling to see on your own 2 feet! After this, you’ll have lunch and then the whole routine begins again!